We are a leading Manufacturer of multi sapphire bangle from Jaipur, India. Being a prominent manufacturer of Multi Sapphire Diamond Bangle, we have set benchmarks in the industrial sector and have successfully raised the bars of customer satisfaction. Diamond Bangles are elegantly designed on various alluring patterns that make them eye grabbing and popular amongst women worldwide. 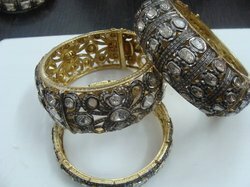 Diamond Bangles are available in various sizes to suit diverse demands of customers.